It’s now pretty well known that West End Games’ take on Star Wars became a major seed of what became the Expanded Universe. Whilst additional stories of questionable canonicity have always been part of the franchise – Alan Dean Foster did Splinter of the Mind’s Eye back when the original trilogy was coming out, based on the story George Lucas had mapped out for the second movie in case the studios wouldn’t give him the budget for Empire Strikes Back – but it’s fair to say that the whole Expanded Universe thing didn’t kick into high gear until Timothy Zahn’s Thrawn trilogy, and it’s well known how when he was writing that Lucasfilm gave him a fat stack of West End supplements to use as background reference material. 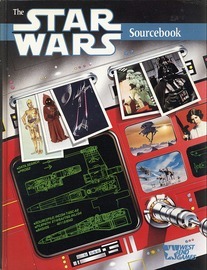 Although much of the Expanded Universe has been declared non-canon by Disney (though they still acknowledge its existence under the Star Wars Legends label), extensive details of the West End line remain having crept into canon via the later films and other materials that didn’t get made into unhistory. What with The Force Awakens cramming Star Wars hype in our faces 24/7 (much of it merited, to be fair, it’s really good), now’s probably a good time to note down my impressions of the old West End Games version of the Star Wars RPG. One of the members of my Monday evening group has been running a campaign of it for a while now, and though I’ve had brief brushes with the system previously this is the most exposure I’ve ever had to it. 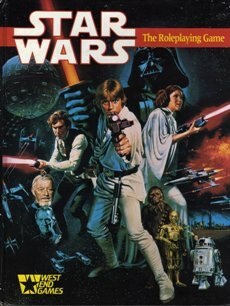 The West End Games version of Star Wars first game out in 1987, and uses a variant of their in-house D6 System which was originally developed for the Ghostbusters RPG. The core book was designed by Greg Costikyan, as one of his last major contributions to West End before he would part way with the company due to disagreements with its owner, Scott Palter. (Also departing at the same time, for the same reasons, was Greg’s fellow Paranoia co-designer Eric Goldberg, who also pulled editing duties on the 1st Edition of Star Wars. The exodus of designers who really “got” Paranoia and were responsible for much of its tone would eventually have dire consequences for the Paranoia line, but that’s a story for another day.) The game see a second edition and a revised and expanded version of the second edition released over the years, as well as generating a massive library of supplements. In fact, an extensive amount of the “Expanded Universe” was invented by West End, or influenced by their work – most notably, Timothy Zahn used West End’s RPG materials when he was writing the Thrawn Trilogy which is generally credited with being the work that really made the Expanded Universe take off. Even though much of the Expanded Universe has been declared non-canon by Disney these days, a few concepts from it have crept back into canon here and there, so West End’s fingerprints still linger on the franchise. The system presented here is nice and simple, in stark contrast to the general fashion when it came to mid-1980s RPG design – though it was an instant hit, winning the Origins award for its rules. The D6 system is perhaps the earliest widely-known example of a dice pool system in RPGs – attributes and skills correspond to dice in the pool, and then you roll them and add together. This can lead to a bit of a slowdown at points for counting – it would be Shadowrun that would introduce the idea, later used extensively by White Wolf, of having a success/failure target number and simply counting the number of dice that hit this benchmark – but otherwise it’s reasonably easy. Elegantly, multiple actions can be attempted in a single round if necessary by simply penalising your pool by one die per action attempted, though as the book points out this will be rarely worth it for starting characters.